Selling for $26.95 0 0 Like this product? Let someone special "piece together" how you really feel! 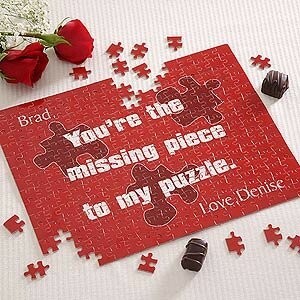 Customize your puzzle with your Valentine's first name, nickname, or title, along with any 3-line message followed by your personal ending sentiment below. Presented in a handsome iridescent red organza bag with satin ribbon pull string, making it ready for gift-giving and providing protective storage for years to come. Perfect for Valentine's Day, Sweetest Day, Birthdays and more! Let someone special "piece together" how you really feel! Customize your puzzle with your Valentine's first name, nickname, or title, along with any 3-line message followed by your personal ending sentiment below. PersonalizationMall.com was founded in 1998 with headquarters located in Burr Ridge, Illinois. Our goal is to serve our customers by making personalized gift buying quick and easy. Our revolutionary preview technology takes the guess work out of personalization, by allowing you to see what your gift will look like, personalized with your details, before you buy it! It shows you went out of your way to find a unique gift and to personalize it to make it theirs alone! The personalized gift is the one that gets passed around at the party, for everyone to see! It makes you feel good to give, and it's even more special to receive! At PersonalizationMall.com, our gifts are as unique as the person receiving it! The majority of the designs we offer were created by our team of talented artists, and available only on our website. We value our customers! Whether you need help choosing a gift, tracking a package or if you have questions once you receive your gift – our award winning customer service team is prepared to give you the answers you need. We are committed to protecting your privacy. Our website is secured by Verisign, an industry leader in online security, so you can be confident that shopping at PersonalizationMall.com is safe. It is also our policy that we never release customer information to third parties.